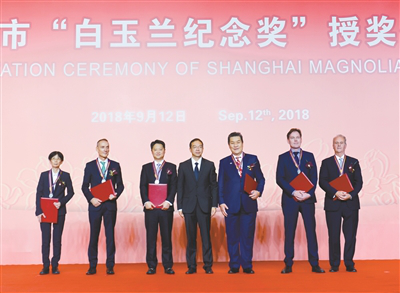 Fifty foreign individuals from nineteen countries were given the 2018 Shanghai Magnolia Award on Sept 12 in recognition of their significant contributions to the city. The winners have all worked in Shanghai for several years, representing fields as diverse as economy and trade, finance, science and technology, education, culture and health. The award, set up in 1989 by the Shanghai Municipal Government, specifically recognises the contributions of Shanghai's foreign residents, with over a thousand recipients to date. As Shanghai aims to develop into economic, financial, trade, shipping, and scientific and technological innovation centers with global influence, it continues to require fresh voices and talented personnel. It is hoped the prospect of awards such as these and other opportunities will attract more talented personnel to the city. Copyright© 2017 Shanghai International Talent Center.